China is accelerating efforts to make its capital a national high-tech innovation hub, as a leading example of the country's innovation drive, by achieving breakthroughs in key technologies and easing permanent residence procedures for overseas experts. The decision was announced on Sept 1 after an executive meeting of the State Council, which was presided over by Premier Li Keqiang. The meeting was a follow-up to the Guideline for Integrated Development of the Beijing-Tianjin-Hebei Cluster, released in April 2015 to balance regional development and ease Beijing's problems such as air pollution and traffic congestion. 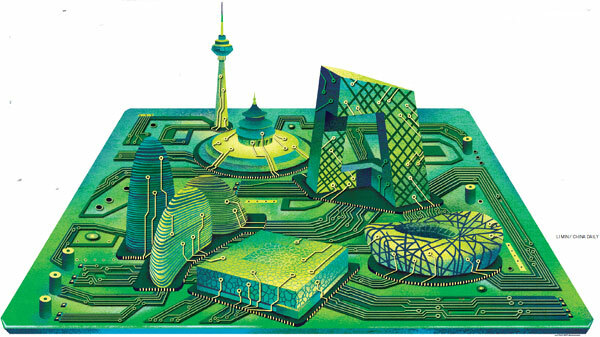 The guideline said Beijing, as a national center for scientific and technological innovation, should upgrade its industries from low-end to medium- and high-end. The meeting's promotional efforts focused on developing fundamental research frontiers in Beijing by taking advantage of its large number of universities and other higher educational institutes, according to a statement released after the meeting. The meeting also called on the capital to speed up breakthroughs in key technology and cultivate an innovative system for research and development with international competitiveness in priority sectors such as smart manufacturing, biological medicine, clean energy and environmental protection. The innovation drive will also include the neighboring regions of Tianjin municipality and Hebei province to support the city cluster's economic growth, according to the statement. Building a national center for scientific and technological innovation will help make full use of the rich research and academic resources in the cluster, said Lian Yuming, president of the International Institute for Urban Development in Beijing. In this process, enterprises should be at the center of innovation with the support of universities and research institutes to cater to market demand, Lian added. The central government also announced promoting pilot practices aimed at easing green card rules to attract overseas talent in Beijing's Zhongguancun area to other regions, the statement added. The Ministry of Public Security announced in January a pilot policy for Beijing, especially for the high-tech hub Zhongguancun that covers 488 square km and has more than 20,000 companies, to facilitate foreigners entering and staying in the capital. On March 1, the policy, consisting of 20 new measures, took effect to target specific groups of foreigners: high-end professionals, overseas Chinese who graduated from foreign universities and hope to start businesses in Beijing, foreign students in the capital and foreigners who work for the city's entrepreneurial startups. The policy marked the nation's second pilot program, after the Shanghai Technology Innovation Center was granted 12 favorable policies in July last year. The move was anticipated to attract more high-level overseas expertise that could provide a steady stream of foreign talent for scientific and technological innovation in the capital. The ministry's Bureau of Exit and Entry Administration said the pilot policy would meet the demands of Beijing to build a national center for scientific and technological innovation set by the guideline, as well as help boost the development of Zhongguancun. Wang Huiyao, president of the Center for China and Globalization, said in a previous interview that Beijing's pilot policy would probably be adopted in other high-tech zones or free-trade zones such as in Tianjin. Wang said overseas Chinese with a doctoral degree received in other countries will be given permanent residency, no matter how long they stay in the capital. Foreigners who have worked for companies in Zhongguancun for four years, with at least a six-month stay each year, will be given the permit as well. Wang said the policy was of real benefit to overseas Chinese and high-end foreign talent as it lowered the threshold. Previously the visa application process was a headache for international conference organizers. Now, visitors from some countries are allowed a 144-hour visa-free stay in Beijing, allowing more than enough time to attend conferences or travel, Wang added.